0	0	Simply Jesus	In Stock - Order before 4pm for same day dispatchWant it on Wednesday 24 April? Trying to understand Jesus in the context of today? Tom Wright's refreshing rediscovery of the Jesus of the Gospels shows how the church's teachings about Jesus have become encrusted with doctrine, dogma and tradition. Sometimes it's so hard to see what the New Testament really says about Jesus, there's a danger that the impact of his message for today's world might be completely lost. 'Simply Jesus' is for anyone concerned with how the Church presents the central personality of the Christian faith today. Life-long Christians, new church members and anyone 'just looking' will find what Tom Wright has to say about the Jesus we think we know surprising, unconventional and even controversial. Simply Jesus re-examines how the church should present the story and identity of Jesus of Nazareth to a world that desperately needs to hear his message. Tom Wright engagingly explores how Jesus' teaching is all about the Kingdom of God, how it's revealed in his life and work, and why that message is as subversive today as it was in first century Palestine. 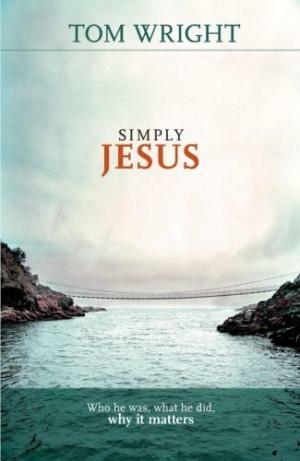 Simply Jesus by Tom Wright was published by SPCK in November 2011 and is our 1518th best seller. The ISBN for Simply Jesus is 9780281064793. Tom Wright sets out to answer three simple questions about Jesus: Who was he, What did he do and Why does it matters? As he explains near the beginning of the book, when we take time to investigate Jesus in his first centry setting we find out that he is deeply mysterious. There are three reasons for this, Tom explains. First, Jesus' world is a strange, foreign country, meaning that people in his day and his country thought differently. They had a different worldview. Secondly, Jesus' God is strange to us, and thirdly, throughout his short public career Jesus spoke and acted as if he were 'in charge'. The rest of the book I found to be a thrilling, captivating journey through Scripture and history, setting Jesus in his own context but helping us to see how relevant Jesus is for our world and our time. I have devoured every word of this book, right through to the final chapter 'Jesus: the ruler of the world'. And I have nearly worn out a pen as I have underlined so many phrases, sentences and paragraphs which came alive as I read! Take a peek at some articles related to Simply Jesus. Got a question? No problem! Just click here to ask us about Simply Jesus.